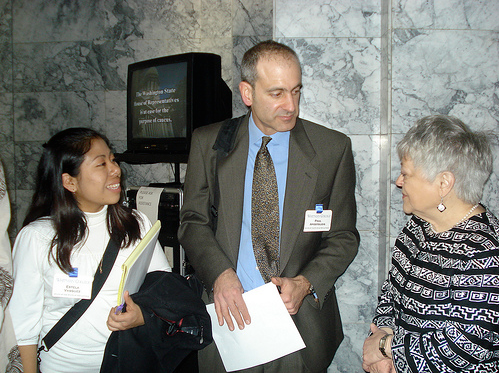 Vasquez '10 (left) with Prof. Apostolidis and State Rep. Gutierrez-Kenney in Olympia, WA. Thanks to her exemplary research with the State of the State for Washington Latinos, Whitman student Estela Vasquez has been invited to serve as a member of the Education Advisory Board of Governor Gregoire’s Interagency Council on Health Disparities. There, Vasquez will be able to draw on the extensive research from both her own experience and the State of the State project to help bring to light the particular issues faced by Washington’s Latino residents in accessing health services and education. Based on her research, Vasquez recommended that school civility programs should include the key elements of “building a community that includes everyone, building collaborative relationships, celebrating and embracing all cultures, and making people aware of racial stereotypes and status issues.” Creating a safe and civil school environment is critical to the academic success of all students.